AuraTransformation™ is an energy treatment method that powerfully activates the influx of the New Time energy. An AuraTransformation™ provides a permanent and radical expansion of your personal consciousness creating synergy between your charisma, drive, intuition and physical actions. The AuraTransformation™ and the consciousness expansion that it creates can bring about many beneficial changes on both personal and universal levels. An AuraTransformation™ dramatically reinforces the impact of the interface between your individual energy field and physical reality. Therefore, you will naturally and easily become less troubled by either the small or large challenges that may have appeared to be coming from outside yourself. Your energy will no longer unconsciously fuel hidden agendas and programs that your true self does not condone. This releases a clear stream of energy from a reservoir that was formerly blocked, stagnant, and murky. You obviously become more happy and focused. AuraTransformation™ is not just a healing method but a tool that can be used for the benefit of individuals who want to upgrade and expand their consciousness, thus aligning themselves with the most current energies. An AuraTransformation™ allows the spirit energy of a person’s aura to open up to the new powerful Indigo and Crystal energy impulses. It then delivers these impulses to the physical body via the balance aura body so that the physical body can translate the impulses into action. An AuraTransformation™ is not a quick fix for all of life’s problems. Rather, it opens a door to the process of reclaiming your own power. AuraTransformation™ is not a substitute for qualified health care for the physical body and/or the mind and is not intended to cure diseases. AuraTransformation™ is intended for people who are relatively stable in their physical and mental health. Furthermore, it is especially important not to get an AuraTransformation™ when emergency professional help is needed. AuraTransformation™ is not something you merely try out, just to see what it’s all about. An AuraTransformation™ is a permanent and thorough expansion of your own consciousness and awareness with no option of turning back – the change is permanent. After an AuraTransformation™ you will begin to take major shortcuts in life. However, you are the one who does the work! In the New Time, nobody else will do the job for you. Everything depends on how much effort you put into your life. An AuraTransformation™ can only be carried out by a highly qualified Aura Mediator™. The Aura Mediator™ works with pure balanced energy during the AuraTransformation™. This energy will be integrated into the client’s own energy system. An AuraTransformation™ jump-starts a major personal evolutionary process, going way beyond the artificially created illusions of duality and hierarchy consciousness. This creates deep inner balance that cannot be described with words. You simply have to experience it! 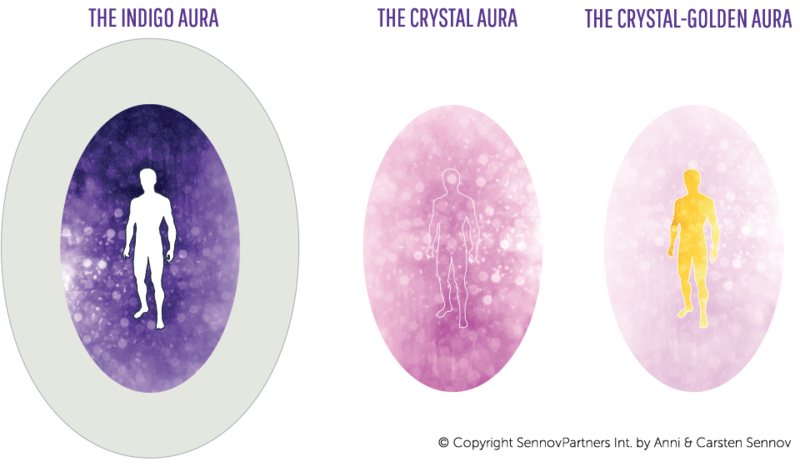 Download the Indigo aura structure in full size. Very many people have the ability to break down the traditional aura structure of another person and this alone can leave you too open and oversensitive. Building up the new aura structure however requires a very specific training and healing power combined with a deep inner balance. As a client, it’s therefore important to make sure that the particular Aura Mediator™ has an up-to-date and formal education from Anni Sennov and her certified instructors. AuraTransformation™ was founded and established in Denmark by Anni Sennov in 1996. 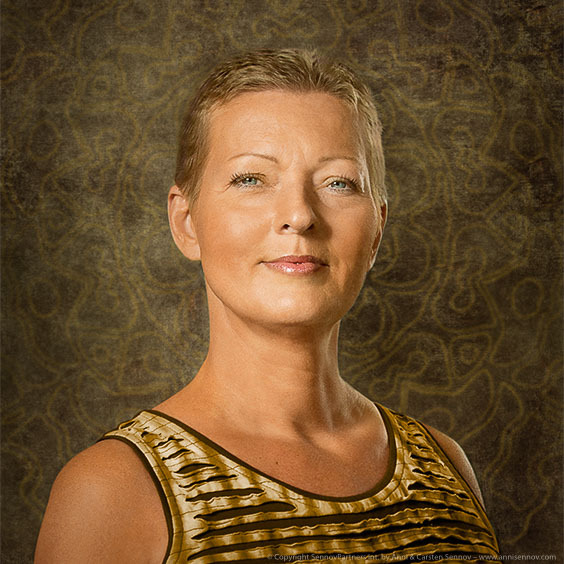 Anni Sennov works closely on a daily basis with the instructors of the Aura Mediator Courses™ around the world. An AuraTransformation™ with a qualified Aura Mediator™ can help parents and adults with their overall personal development as well as help them to meet the children at the children’s level and to understand their direct and honest way of thinking. Before having your aura transformed it’s required that you read the following book Balance on All Levels with the Crystal and Indigo Energies by Anni Sennov. Visit our list of selected English-speaking Aura Mediators in several countries.